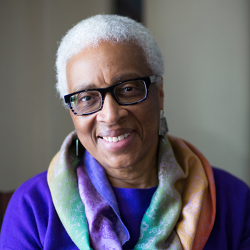 Justice Geraldine Hines '71: "Race, Policing and the Constitution: Do Black Lives Matter?" Justice Geraldine Hines, former associate justice of the Massachusetts Supreme Judicial Court, will present a free public lecture on the epidemic of racialized policing in the U.S. and the failure of the Supreme Court's Fourth Amendment jurisprudence to offer meaningful options for remedies. A 1971 UW Law graduate, Justice Hines is visiting campus as part of the Brittingham Distinguished Visiting Scholar program. The program aims to introduce advanced students to those working “in the field” who can help them increase their awareness of the kinds of expertise and accomplishments they will need after they graduate. In addition to the public lecture, Justice Hines will give the keynote address at the Pre-Law Diversity Day on February 22, and teach in several undergraduate and law classes. The Brittingham Visiting Scholars program is funded by the Brittingham Foundation.